“…tripartite cosmos that is also represented symbolically in the blackbird, stag, and trout. Although the evidence is allusive and never as explicit as a statement of preserved prior belief, durable sets of motifs and far-reaching homological correspondences among these sets suggest an archaic Celtic conception of an equilibrated tripartite cosmos comprising 1) the sky or heavens, 2) the earth’s surface, the human world, and 3) the underearth and undersea. Christian theology, with its linear, rather than cyclic, time, and hierarchy of heaven above and hell below, modified the pagan worldview in both subtle and far-reaching ways and the synthesis as we meet it in the learned and narrative Irish texts of the early Middle Ages is distinctive. The two spatial co-ordinates—vertical and horizontal—organize cosmological motifs in early Irish literature: “vertical” but not necessarily hierarchized triadic sets and their “horizontal” extensions through homological correspondences that may vary in scalar terms. We may imagine a grid with such groupings as 1) elemental dimensions (heaven; earth’s surface; underearth and undersea); 2) social estate (kings, priests, lawmen, poets, historians; warriors; hospitallers, cultivators, herdsmen, hunters); 3) body parts (head, eyes, faculty of speech; arms, upper torso; lower torso, legs); 4) royal sins (injustice, sacrilege; cowardice, misuse of military force; economic extortion, sexual abuse); 5) punishments (hanging; wounding with weapons; pits, prisons); 6) colors (white; red; blue/green/black); and so on. Three understudied reflections of the tripartite cosmos and its homological extensions that may be reviewed prior to a reconsideration of “the man in the tree” are water-fowl in early Irish narrative, the incantatory human stance called corrguinecht, and standing stones, sacred trees, and other expressions of the axis mundi. Water fowl often occur in the run-up to the central action of several Irish tales. They are elusive, when hunted by Cú Chulainn and his fellow Ulstermen in Serglige Con Culainn (The Wasting Sickness of Cú Chulainn), or tauntingly joined by chains of red gold as they fly overhead. Such birds are hypostases of women from the síd or “fairy mound”. In linking the water fowl motif with cosmic organization, we may identify the bird’s trifunctionality in its ability to fly in the air, walk on land, and stand or swim in water. The crane, to take one gawky but graceful example, thus comprehensively resumes the inherent verticality of such phrasings as heaven, earth, and undersea. In early Irish texts the magic-working technique called corrguinecht (perhaps with an allusion to corr “crane”) is an attribute of superior figures (euhemerized gods) and of sorcerers. A vow or curse is given greater efficacy by the practitioner, with one eye closed, reciting in one breath into the fist of one hand, while standing on one leg (on occasion by a doorpost, see below). The three cosmic components are here implicated in the following equivalences: eye, breath (head) = sky; fist (as part of the arms and torso) = earth’s surface; leg = underearth, all joined along the axis of the human body. The vertical position is combined with a reduction of the binary or dual (in a sense, horizontal and lateral) to the unitary, in what seems both a sacrifice and compensatory intensification of power (cf. the potent one-eyed and one-armed figures of many earlier and medieval literatures, not least Norse Óðinn and Týr). While not always an inimical or anti-social act, corrguinecht is performed alone and seeks to alter the course of events. The vertical axis that informs most allusions to a tripartite cosmos is also to be found in a variety of other metonyms, miniatures, or compressions of various kinds—all instantiations of the fundamental cosmic integrity. While I agree with most of the analysis offered here (and I recommend reading the article in its entirety) I am less than convinced that the pre-Christian Irish, Scots and Manx believed in the concept of an axis mundi (a Latin term used in modern studies of ancient mythologies to indicate a world tree or world pillar that normally lies at the geographical centre of the universe, often binding different levels of it together). There is no denying that sacred trees (and groves) were part of Gaelic and Celtic culture in general. The Irish language uses the words bile “scared tree” and crann beatha “tree of life” to indicate trees that were held to be of great significance, usually in association with mytho-historical legends. Many Irish kingdoms had a bile within their territory, often in a central region, which was venerated by the local population and held to be of import to the kingdom’s well-being (military raids to cut down or burn these trees by external enemies were not unknown well into the historical era). Such trees were usually associated the Otherworld People, the Tuatha Dé Danann and Aos Sí, and this along with their origin-stories was normally why they were given such prestige and respect. A distant echo of this survived into the 20th century with the untouchable “fairy trees” that used to proliferate across the Irish countryside (though it is debatable if such a tradition still survives in these venal times). However that does not mean that every tree was sacred or held to be of significance to the gods in pre-Christian and early Medieval Ireland. Timber and wood were essential materials in the ancient Irish economy and indeed many woods and forests were privately owned. By the 8th century CE some of the great monastic-towns had become mercantile corporations with a considerable investment in forestry, in the process taking ownership of many hitherto wilderness lands (which of course placed them at odds with the youthful or property-free hunter-warrior bands of the historic fianna who traditionally regarded such regions as their own). So while some trees were honoured most were not. Likewise the use of galláin or standing-stones to indicate the sites of ancient burials or battles, sacred areas or as boundary markers, was a mixture of the religious and the practical. The stones were clearly of some significance and some could be carved or inscribed with Ogham writing but one rarely reads of anything approaching worship. It should be stressed that contrary to some popular modern myths neither the Irish nor the Celts in general believed in “nature spirits” or that all trees or stones had some form of animate life. Yes, certain stones could cry out at the touch of a king or such-like, but they were very much the exception and the thinking behind it not readily reducible to that of spirits within. By far the most common division of the universe in the Gaelic traditions of Ireland, Scotland and the Isle of Man is the duality presented by the surface world and that of the subterranean/submaritime Sí or Otherworld (depending on the context the Irish word Sí means both “the Otherworld” in general and specifically a single “Otherworld residence, territory”). While the surface world is the home of mankind the latter form’s the home of the ancient gods and goddesses of the north-western Celts albeit carefully rearranged and disguised in literary dress as the Tuatha Dé Danann and Aos Sí by the Irish monastic scribes. The Otherworld People lived in a parallel world beneath our own, with its own sky, sun, lands and seas, only of far greater beauty and wonder. This idealized version of the world above was reached in part through the ancient burial mounds and other prehistoric monuments that dotted the landscapes of western Europe and which were often presented as the concealed residences of the leading lords or kings of the Otherworld folk (hence the dual meaning of the word Sí). Alternatively it could be reached through caves, under springs or lakes, under or across the sea, through mists or simply though sudden revelation. Nowhere does the actual sky or firmament feature as a cosmological abode. The Celtic pantheon most assuredly never dwelt in the heavens. The Celtic heaven, if we may name it as such, was below the ground and sea or it invisibly weaved its way throughout the lands of humankind. Thus the encounter with and revelation of Dearg Corra’s identity probably has more to do with revealing the presence of the Otherworld in this world than in some tripartite “sky-earth-underworld” allegory (despite the symbolic love of triads in the Celtic and Gaelic civilizations). This does not discount the importance of the day-time or night-time skies as a basic fact of nature and thus requiring a place in any ancient cosmology. The pre-modern Gaels must have had some explanation for the sky above and indeed such creatures as the Bocánaigh and Bánánaigh were inhabitants or beings of it. Likewise birds in flight or the movement of clouds could be used for divination or predicting the future (the outcome of a battle or such like). And of course the ancient Irish oath calling for the skies to fall upon the earth along with earthquakes and floods implies some sort of understood myth. But the sky, as far as one can tell, was the lesser of all the Irish literary motifs or symbolic tags. Even in the florid descriptions of the Otherworld, where significant tress and groves abound, there is no mention of a tree that has roots and branches reaching through all the worlds or which lies at the cosmological centre of all the worlds. And while there may have existed the Ail na Míreann or great stone at Uisneach, the ancient centre of Ireland, the concept of a single “world tree” on the lines of a Yggdrasil or a world pillar seem absent from most accounts, even in allegorical terms. Is de dobert Finn a hordain ina béolo. Addonich as eisib afrithisi fortnosna a imbus & dichan dicetal co n_eipert: ‘Con fri lon lethcno contethain cotith in dithraib Dercc Corra comól fri hich ni ba filliud fabaill a uball fín mblais cona fricarbaith mac úi co dedail Daigre.’ ‘Dercc Corra mac húi Daigre’, ol sé, ‘fil isan crund’. Then Dearg Corra went into exile and dwelt in a wood and used to go about on shanks of deer for his lightness. One day as Fionn was in the wood seeking him he saw a man in the top of a tree, a blackbird on his right shoulder and in his left hand a white vessel of bronze, filled with water, in which was a jumping trout, and a stag at the foot of the tree. And this was the practice of the man, cracking nuts; and he would give half the kernel of a nut to the blackbird that was on his right shoulder while he would himself eat the other half; and he would take an apple out of the bronze vessel that was in his left hand, divide it in two, throw one half to the stag that was at the foot of the tree, and then eat the other half himself. And on it he would drink a sip of the bronze vessel that was in his hand, so that he and the trout and the stag and the blackbird drank together. 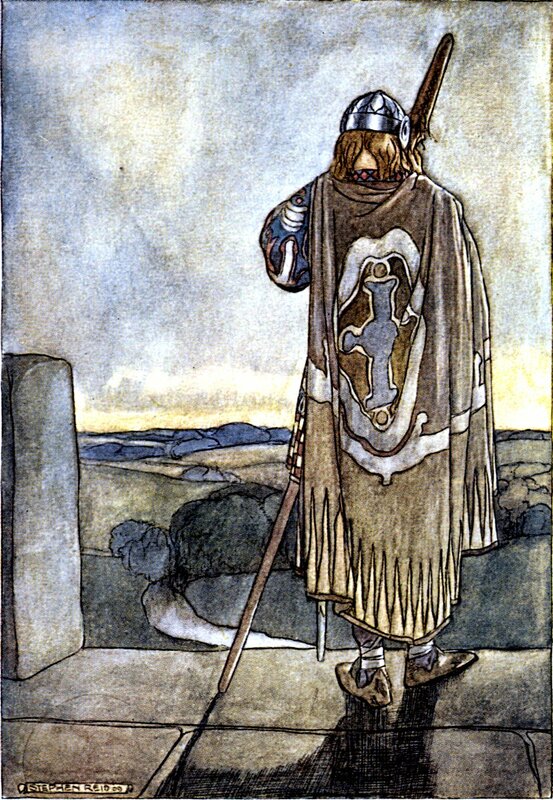 Then his followers asked of Fionn who he in the tree was, for they did not recognise him on account of the cloak [hooded-cloak?] of concealment which he wore.